First of all, I want to issue a disclaimer. Although this is a satirical news site, our product reviews are mostly serious and definitely objective and even though we still inject some humor, the review is an honest representation of how we rate the products we review. Check back through our product review history and see for yourself. Programmable thermostats are not new, in fact programmable thermostats have been confusing people since the 1950's. The major flaw with most programmable thermostats is that they take too damn long to program. Most people that I know, including myself, struggle through the initial setup, and get the thing programmed and then leave it. I never adjusted the program on mine in the 7 years since it was installed. 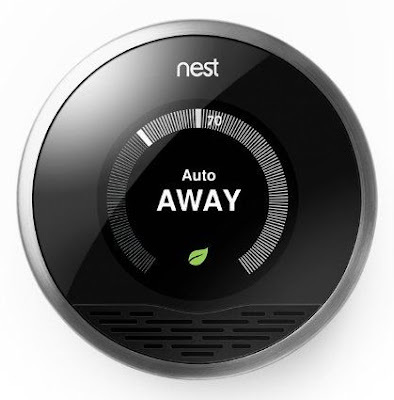 Then quite by accident I came across Nest: The Learning Thermostat. I was intrigued by it's sleek look so I clicked the link and started learning. The more I read, the better it sounded, and the more I wanted one. Then my conscience kicked in - this sounds too good to be true. A smart thermostat which connects to the internet and has multiple sensors to measure light, movement and humidity. A thermostat which can detect when you are not home and adjusts itself to save energy. It learns when you leave for work, when you come home again, when you go to bed, and other times that you habitually adjust the temperature in your house. And the real clincher, a thermostat which can be controlled remotely via the internet from a computer or mobile device. How lazy are we getting? If I am in my bedroom and it feels a little chilly, I can reach for my smartphone, load the app and change the temperature setting almost instantly, instead of snuggling deeper into my Winnie the Pooh comforter. Yes this thermobrain looks good, is simple to use and has a very high novelty value, but there is more to love underneath the glossy mirrored surface. 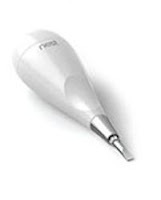 A number of energy saving features have been incorporated into this device. The Airwave Mode automatically kicks in to save energy when cooling, by powering off the AC unit (which continues to chill the air for a short while after switching off), while keeping the fans running until the target temperature is achieved. Nest also teaches you ways to save energy with the use of a simple leaf icon on the display. The leaf pops up when you make an energy saving temperature choice, like setting the cooling temperature to 74 instead of 72. Once trained, Nest can also use outside temperature data from the internet, combined with what it has learned about your system to tell you how long it will take to reach your target temperature, allowing you to make more energy efficient choices. And if all that is not enough, when the Nest sensors don't detect a presence for a couple of hours, it will automatically set itself to Away Mode and heat or cool to a more efficient, pre-programmed temperature. And since it is smart, it won't assume you are out, just because you have gone to bed. 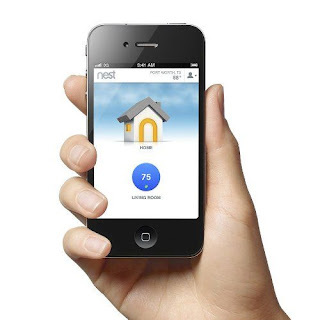 Then just as you have got your mind around all that information, Nest also gives you access to energy reports on your phone or computer, giving you a breakdown of running time for your heating/cooling system and possible reasons for being above or below average. And for those people who want to get up and use the Nest manually, a simple twist of the face adjusts the temperature. Clockwise for hotter, counter-clockwise to cool. Pressing the face is the equivalent of pressing enter when in programming mode. Enough about the features, how tough is it to install? Installation was a breeze, and it took just 30 minutes, including the setup and wifi connection. The hardest part was figuring out how to remove the old thermostat. The Nest team have thought of absolutely everything including the design of the packaging, which was incredibly clean, green and probably award winning. When you buy one, you will see what I mean. They even included a cute mini screwdriver with 4 interchangeable bits concealed in the handle. The instruction booklet had sticky labels to attach to the wires as you removed them from the old thermostat so that you can be sure to put them into the correct clips (like the red and black clips on the back of a speaker) on the new Nest thermostat. They also include 3 options for mounting the Nest in place of your old thermostat, a rectangular plate about the same size as a standard programmable thermostat, a square plate to cover the holes from an older rotary style thermostat, and a metal plate which will screw onto a junction box if you are replacing an archaic thermostat. 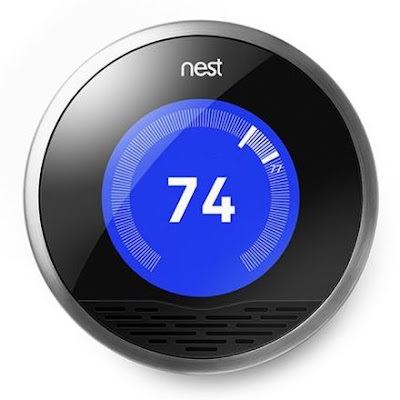 You will need to run an online compatibilty test before buying a Nest Learning Thermostat to ensure that you current system can be controlled correctly. You simply look at the wires going into your current thermostat and enter them into the web page, which will then tell you if you can install a Nest to control your equipment. What about the bad, surely it can't all be good? So far, my major complaint is that it sticks out from the wall too far, and the display, when not in use, has a kind of fish-eye lens appearance. Both cosmetic issues and I am learning to adapt. 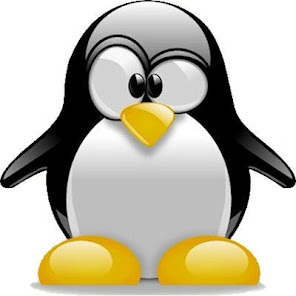 I also had a brief moment on the second day when I could not connect to the Nest across the internet, while I was in work. The trouble shooting guide suggests that this could be due to internal battery recharging, wi-fi or router issues in the home, installing an (automatic) upgrade, or Armageddon, in which case controlling your thermostat remotely is the least of your worries. (I made up that last one). This is a must for control freaks and tech geeks who need to assimilate with their equipment. Or for people who want to take more control of their energy bills without expending extra energy. The Nest Learning Thermostat is not cheap ($250 at time of writing) but the payback in energy savings over its lifetime far outweigh the initial cost. 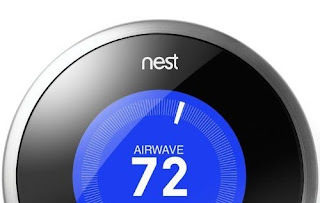 To get more information or buy the Nest: Learning Thermostat click HERE. Do you have a product which needs reviewing? 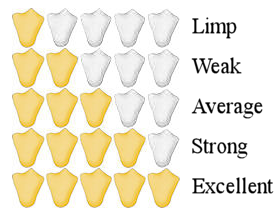 Some of our reviews are compensated reviews whereby we receive an item for evaluation at little or no charge. Our sponsors expect and appreciate that we write our reviews honestly and objectively without bias or favor. (c) Slap the Penguin. Awesome Inc. theme. Powered by Blogger.